Now that we're catching up, I have crazy exciting news to share with you! Admittedly it's a little late sharing here (possibly you have already seen my Instagram post erm, 5 weeks ago) that this blog saltnpepperhere.com was shortlisted for a Taste Canada Award in the 'health and special diet blog' category! Say whaaa?! I was truly taken by surprise. I didn't know the short list was announced that day (July 18) and was unaware of the honor until a few blogger friends messaged me their congratulations. Total fool that I am, I assumed the first congratulatory message was unintentionally sent to me, and got more puzzled with the next couple of DMs until more lovely comments flooded in and someone finally enlightened this idiot by spelling it out for me. Then it sank in. I was so elated! But I feel honored to be a finalist, cliched as it sounds. I never would have predicted this type of recognition when I started this blog less than 2 years ago. I feel like now is also a good time to thank you, the readers, for reading my posts, making my recipes and/or leaving comments for me. You all encourage and inspire me to keep creating new recipes and content on this site. THANK YOU!! 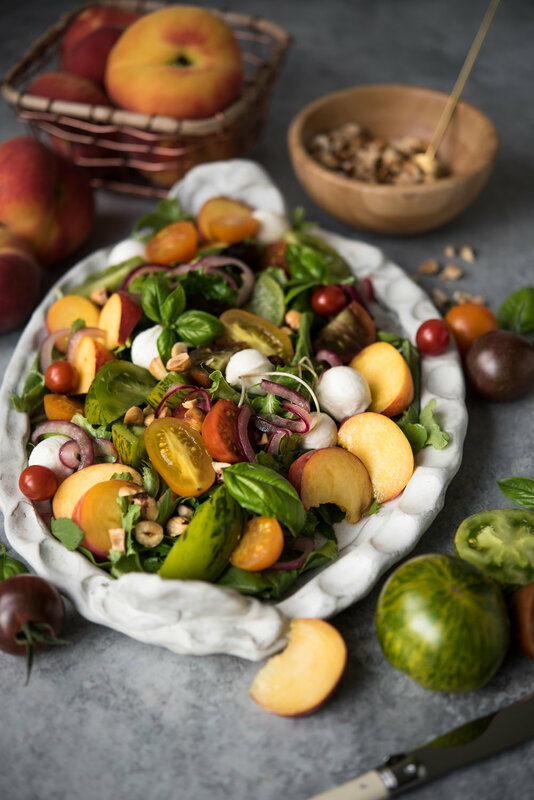 Finally, I'll leave you with this recipe for a quintessential summer salad that sings with the best flavors the season has to offer. 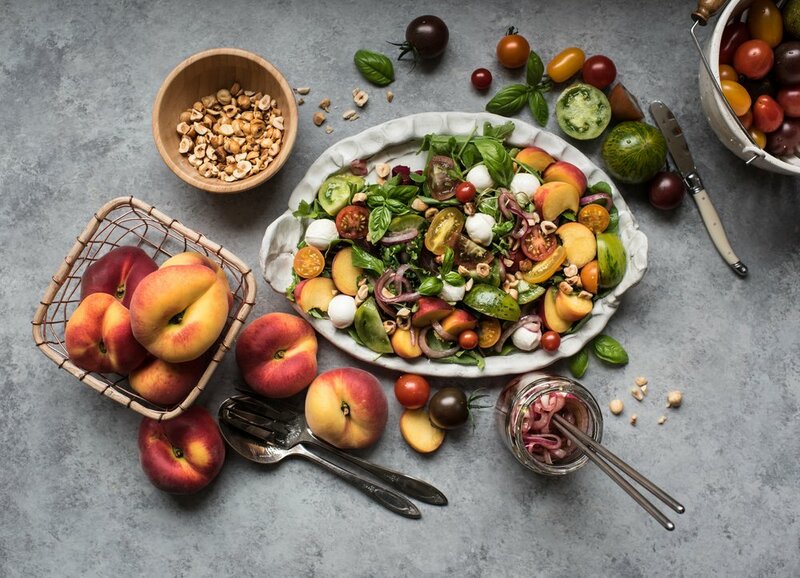 The peaches and heirloom tomatoes are at their absolute peaks right now and demand to have their flavors shine. And shine they do. There are no complicated ingredients. OK I lied to you. There is ONE surprise ingredient that I want every single one of you to get acquainted with: UMEBOSHI VINEGAR. Aka ume (Japanese plum) vinegar. 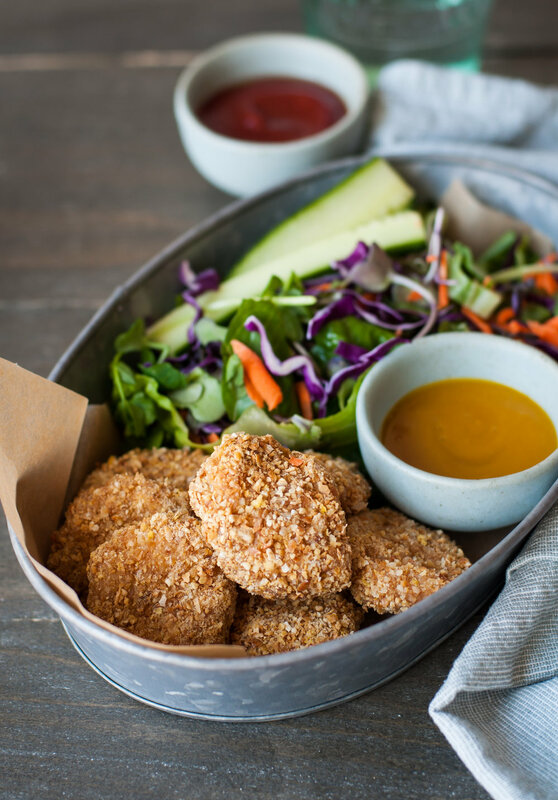 Aka a must-have in your pantry to put on all the things including this salad. It is a salty "brine" with a bit of tang and fruitiness, created as a by-product of making umeboshi, a pickled Japanese plum. You may have had it at Japanese restaurants, the vinegar or the umeboshi itself. My first encounter many years ago was in the form of umeboshi paste schmeared inside a sushi hand roll along with shiso leaves. Oh. My. Gurd. Earth shattering discovery. My other favorite is that single whole umeboshi bobbing in the ramen at my favorite Toronto joint, to be enjoyed at the very end to aid digestion - one of the admired health qualities of ume. The umeboshi vinegar is a handy condiment to add into salad dressings to effortlessly give additional dimension with that briny fruity tartness. It can be purchased at well-stocked grocery stores, ethnic grocery stores and health food stores. If you really can't get it, you can still make this recipe by subbing with red wine vinegar and an additional bit of salt. I brought this to a dinner party recently and people admired how beautiful the salad looked. She is rather purdy, isn't she? And one person said it was one of the best salads she's ever had - one of those rare dishes that taste just as good as it looks. I love compliments like that! If you love compliments too, this easy yet impressive salad is all yours for the making. Do it before summer is over! The pickled red onions and the vinaigrette can both be made a day or even two in advance. Keep them in the fridge but take it out to let it warm up to liquid state before using. Umeboshi vinegar is made from Japanese plums (called ume). I have seen it at well-stocked grocery stores, ethnic stores and health food stores. If you can't get your hands on it, just sub it with red wine vinegar and an additional bit of salt. For paleo or vegan version, simply omit the bocconcini. Serves 4 as a main, more as a side. 1. Combine the ingredients for the pickled red onions and set aside for at least 15 minutes, up to a day or two. 2. Combine the ingredients for the vinaigrette, whisking until emulsified. Taste and add more salt to taste. Set aside. 3. In a large bowl, toss the salad greens and microgreens (or sprouts) gently with about 3/4th of the vinaigrette until all the leaves are evenly coated. Taste and sprinkle more salt if needed. Spread on your serving platter. 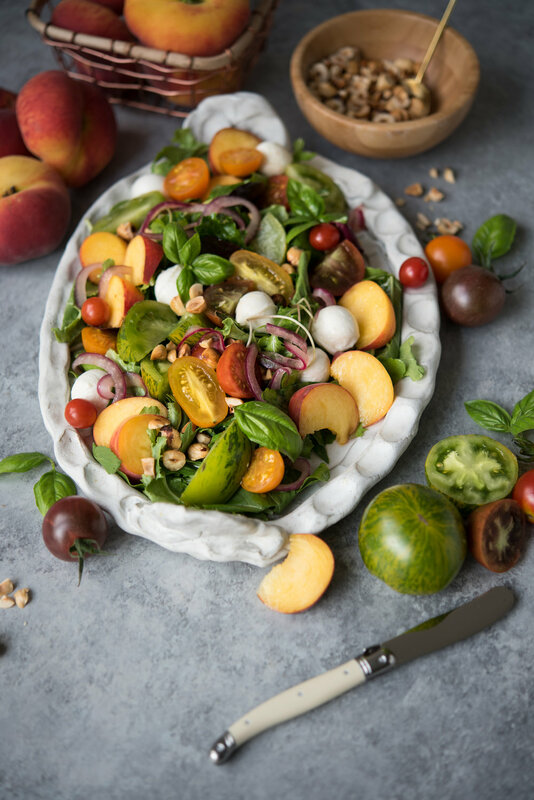 In the same bowl, toss the peaches, tomatoes and bocconcini (if using) in the remaining vinaigrette. Spread atop the salad. Scatter the fresh basil leaves pickled red onions (some of that yummy liquid too) and toasted chopped hazelnut over the whole thing. SO GOOD!